After nearly a decade of teaching both introductory and advanced workshops in abstract painting, Rebecca now teaches a limited number of workshops for advanced students. 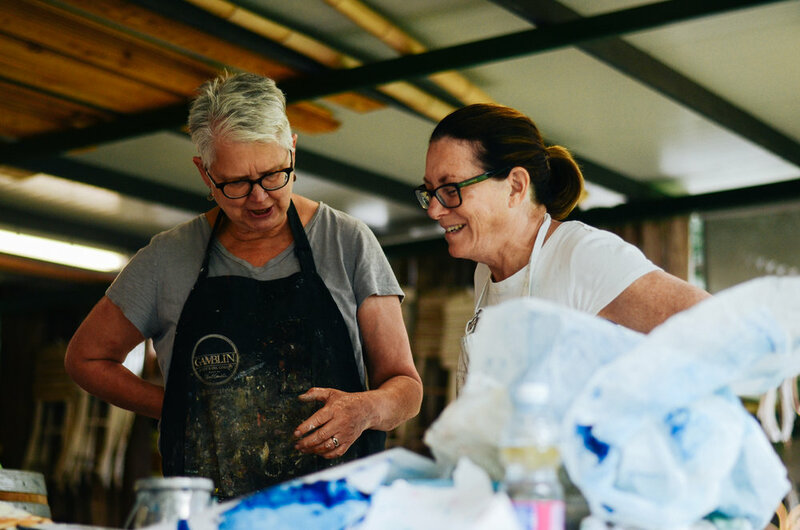 In these workshops, familiarity with materials and techniques is a prerequisite, and the focus is on personal direction and strengthening the artist’s knowledge of visual elements, principles of design, and meaningful abstract content. Depending on their length, workshops include personal, one-on-one consultations, as well slide presentations, discussions, individualized instruction and plenty of working time. Description: In this workshop at Ballinglen Arts Foundation, a world-class facility located in a small Irish village, experienced artists will have time to explore meaningful sources and intentions for their work, and to strengthen their work in CWM. The week will include plenty of working time, private/individual consultations, a field trip along the spectacular North Mayo coast, and presentations on topics related to personal voice and abstraction. Rebecca Crowell is widely known for her innovative abstract paintings using CWM and oils and for developing many of the techniques now widely used in the cold wax community. She has been a professional artist for over 30 years, with representation in numerous galleries in the United States and in Ireland. Her work is found in hundreds of private, public and corporate collections in the US and internationally. Rebecca has a background in university-level teaching with the University of Wisconsin, and has been teaching workshops in the use of CWM since 2009. Her commitment is to helping other artists find personal direction in their work through strengthening their confidence with CWM techniques, and to sharing her knowledge gained from many years of painting experience. She is the co-author (with Jerry McLaughlin) of Cold Wax Medium: Techniques, Concepts & Conversations, the first comprehensive book about working with CWM. She also writes a monthly blog, http://rebeccacrowellart.com and produces a weekly art podcast, The Messy Studio, in collaboration with her son Ross. Rebecca travels often internationally for teaching and artist residencies, and the more remote locations she prefers inform the textures, colors and shapes of her work. Her travels include time spent in Ireland, Spain, Italy, New Zealand, Sweden and Canada. She and her husband Don divide their time between their longtime residence in rural Wisconsin and an old adobe house near Taos, New Mexico.